how do u calculate the ratio of the weight a bridge can hold? The easiest way is to load it till it breaks, and divide that weight by 5 or so. Don’t trust it with lives, but you can bs an estimated max weight. To do it right, you need to perform a static analysis of the truss members (look up the joint method on google) to determine the load on each member. Then you need to find the shear and bending moments of each of the members (or so I think, I’m in mechanical engineering, there might be an easier way, probably not, still google that). Find all these values as equations with a weight variable in them (i.e. force on the member ab = 2.1*W). Then you can determine when your welds (whatever holds your members together) will break by googling the welds rated forces (compression, shear, tension) and setting the highest weight ratio equal to the max values then solve for the weight (your max weight before the first weld will likely pop). After, you set the largest bending moment in the bridge equal to the largest recommended bending moment of that material. Reference a material guide, steel beams are by convention rated to a max bending moment which can be found via google, wood can be found too for simple shapes, straws and hollow pipe must be researched on how to calculate it. This determines the highest weight at which the member most susceptible to bending is going to buckle. At last you can check the maximum tension and compression of the materials against your highest member tension and compression in the same way, using the reference probably found in your last google search. The lowest of those weights will shows you what weight the first part of your bridge to fail. Divide that value by 5 for a factor of safety and you’re done, that’s the max rating for your bridge. Hi, I’m in Year 12 and we need to design a lightweight spaghetti bridge and I’m currently deciding between Warren truss and Howe truss. My teacher in Engineering told us that we should consider pasta stronger in compression than in tension and from what I’ve “researched”, the Warren truss is the best but the Howe truss is good in compression. I’m not sure which one as I’m not sure whether warren is better in compression. Please help me decide. I am an eleventh grade student and I would like to take this time to thank you for your wonderfully helpful website. My physics class is currently beginning a balsa wood bridge project and your examples of different trusses have been particularly helpful, as well as your tips on types of glue and types of joints. I would also like to take this time to ask a question. For our bridge, we are being given strips of balsa wood that are about a centimeter cubed. Would doubling up the wood be helpful and more supportive to the overall structure, or would it simply make the bridge weigh more and subtract from the bridge’s efficiency? Thank you very much for your time and consideration. Which triangle is the best? equilateral or isoceles? and out of these 4 which bridge is the best? Equaliteral because you want it to be sturdy and strong and in a right angle to hold more efficant, and im an 8th grader. Well for it to be a right triangle it must be scalene so but an equilateral triangle would work the best. No, a right triangle can also be an isosceles triangle with two 45º angles and one 90º angle. Equilateral triangles are ideal because they evenly distribute the force among all angles. These work well for trusses, but for your tension and compression beams, it is best to combine them in a right triangle so that you can put more weight on either the tension of compression beams (depending on the tensile and compressive strength of your material). Equilateral is always the best. The pressure hits the same on all sides. Good luck! Alex, good point. I made a mistake with those example images for the Warren Truss. A true Warren is indeed made from equilateral triangles. I have updated the images in the article. Thanks. Austin, I do not understand what you are asking. Probably dont need to support the floor, all the wieght will be on the sides(because of the ropes). I made a bridge that was 496g and 70cm long. It was a combination of a howe and pratt truss(they made Xs like lXlXlXl) with a supporting truss below the stress point(where the ropes will be). it hold 200pounds, but we didnt have enough weights to continue, it didnt crack or have any damage on it(other than divets where the ropes rested on). You shouldnt have any problem with holding 1 to 5 kgs. Hello I’m in 6th grade and I am seeing which design of truss bridge is the strongest. I am doing all of the bridges above, but I was wondering which materials would be the best to use… Please don’t say metal or something expensive because im only in 6th grade. Thanks! I know that this page is devoted to Trusses, but what are the advantages/disadvantages of using an Arch as opposed to a truss? The bridge must span 20″ and have a maximum hight of 10″, performance is based on weight ratio, however I would love to break the school record. Made of 1/8 x 1/8 x 36″ balsa stringers. What truss design do you recommend if there are 5 equal loads placed across the top of the bridge, if the bridge span is 10 inches? I was thinking that the warren truss design might be best and that I should double up the thickness of the trusses inside the span. But this is my first time trying this so I don’t know. i am building a warren truss with vertical supports, made of popsicle sticks, and wood glue. is this good enough to hold 20 lbs.?? Most likely, depending on how well you construct it. 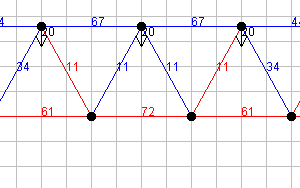 If I’m building a warren truss (basswood), does adding verticals in the triangles make much of a difference in the weight it could hold, or is it just adding unneeded weight to the bridge? Sarah, the verticals in a Warren truss are quite useful, and can add a lot of strength to your bridge. They break the top (and bottom) chord into smaller sections. This helps because the top chord is in compression. Wood will bend and eventually break (buckle) when under compression. The vertical members help the top chord resist buckling and thus increase the strength of the bridge. Great question. Hey, Garrett. I’m building my first bridge (out of basswood). My design’s really simple; I’m doing a Warren truss with vertical sticks in between the sides of each triangle. My question is this: I’m gluing the sides of each triangle to the outside of the bridge. Would it be better to glue the vertical sticks to the inside of the bridge, or on the outside as well? This is a great question. The answer, according to my knowledge, is slightly complicated. When you take a stick of wood and hold it vertically with one end on a table and the other end in the middle of the palm of your hand, you can push straight down on the stick. Because the ends of the stick are “free”, the stick bends in a perfect arc shape. However, if you were to push down while holding the ends of the stick, it would bend in a more complex shape. Perhaps an S shape or something weird. In the second case it would be harder for the stick to begin bending. Thus, by holding the ends of the stick you actually increase it’s strength. However, if you glue a piece in compression on the outside as you say (called a Lap joint), the strength of the joint is in the surface face of the wood. And End joint (see my Bridge Joints page for pictures) doesn’t have that issue. The ultimate joint for a member in compression is a Gusseted joint. It combines the value of End and Lap joints. However, it uses more wood and glue, and thus is heavier. Hello! Our team is making a bridge out of basswood and when we test our bridge, weights will be placed on the bottom floor center. We were going for the Pratt or Howe design but we got confused as to which one is going to be able to support the centered weight the most…or does it not matter? Hi, I am doing an extra credit project for my school and I’m am suppose to construct a bridge out of craft sticks and glue. I have been researching for different bridge structures I could try, but I would like to know your opinion in which structures I should try first. Also, this bridge must be able to hold a text book that is about 3kg, this has been a obstacle for my bridge. I would greatly appreciate your input. That will help give you some ideas of where to start. which of these designs are best when the weight is loaed by hanging the weights from the botton of the sturcture?? Garrett, I have a project in which I have to build a truss bridge with pre-cut wood. They are the really thin but long ones made from basswood. The way the weight is applied is by placing a block inside the structure with a pipe from the bottom to pump more pressure. How would you suggest I build the “floor” of the bridge to support the weight? Caleb, my first recommendation is that you make your bridge just wide enough for the block to rest inside. 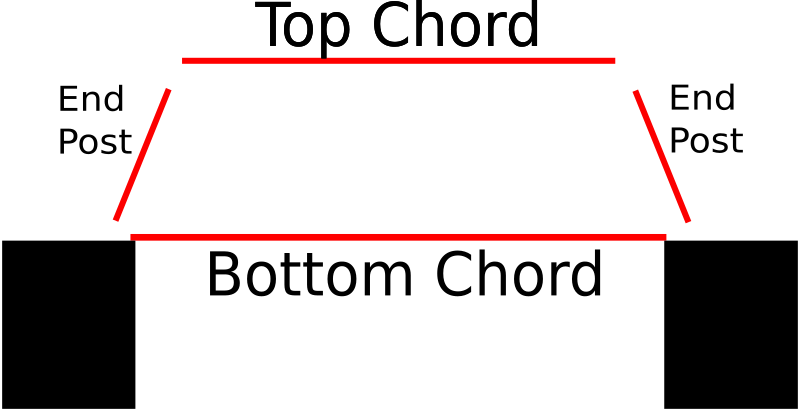 The block should rest directly on the two bottom chords for maximum strength. 39 queries in 0.440 seconds.